It’s currently accepted theory that every galaxy has a super massive black hole (SMBH) at it’s center. These black holes have been observed to be strongly correlated with the galaxy’s bulge mass, total stellar mass and velocity dispersion. Figure 1: NGC 2623 – one of the merging galaxies observed in this study. Image credit: NASA. The mechanism which drives this has long thought to be mergers (although there are recent findings showing the bulgeless galaxies which have not undergone a merger also host high mass SMBHs) which causes a funneling of gas into the center of a galaxy, which is either used in a burst of star formation or accreted by the black hole. 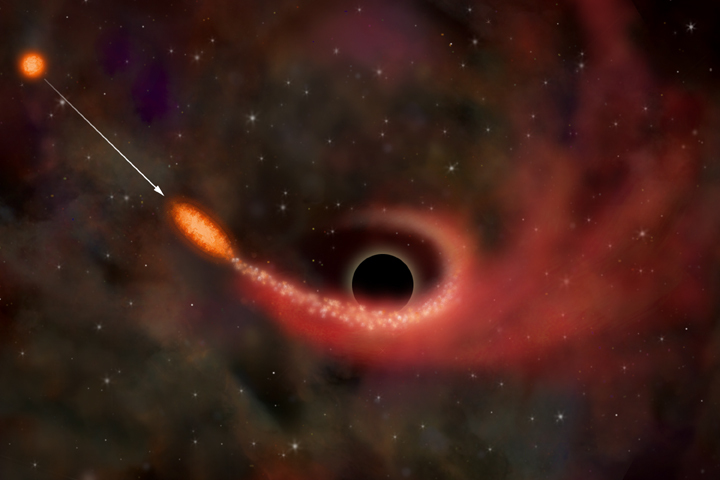 The black hole itself can regulate both its and the galaxy’s growth if it becomes active and throws off huge winds which expel the gas needed for star formation and black hole growth on short timescales. To understand the interplay between these effects the authors of this paper study 9 nearby ultra luminous infrared galaxies in a range of stages through a merger and measure the mass of the black holes at the center of each. They calculated these masses from spectra taken with the Keck telescopes on Mauna Kea, Hawaii by measuring the stellar kinematics (the movement of the stars around the black hole) as shown by the doppler broadening of the emission lines in the spectra. Doppler broadening occurs when gas is emitting light at a very specific wavelength but is also moving either towards or away from us (or both if it is rotating around a central object). Some of this emission is doppler shifted to larger or smaller wavelengths effectively smearing (or broadening) a narrow emission line into a broad one. From this estimate of the rotational velocities of the stars around the centre of the galaxy, the mass of the black hole and the velocity dispersion can be calculated. 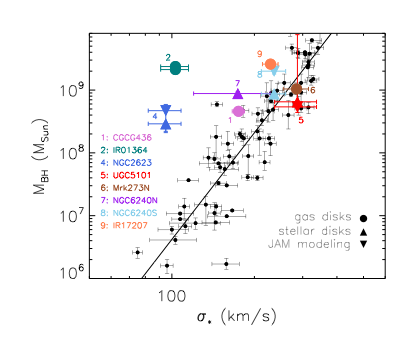 These measurements for the 9 galaxies in this study are plotted in Figure 1 (originally Fig. 2 in Medling et al. 2015) and are shown to be either within the scatter or above the typical relationship between black hole mass and velocity dispersion. The authors run a Kolmogorov-Smirnoff statistical test on the data to confirm that these merging galaxies are drawn from a completely different population to those that lie on the relation with a p-value of 0.003, i.e. 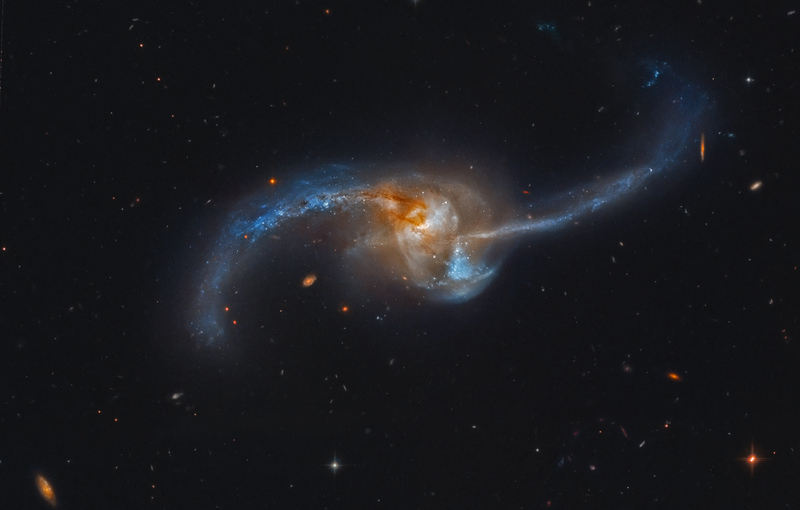 the likelihood of the these merging galaxies being drawn from the same population as the typical galaxies is 0.3%. The black holes therefore have a larger mass than they should for the stellar velocity dispersion in the galaxy. This suggests that the black hole grows first in a merger before the bulges of the two galaxies have fully merged and settled into a gravitationally stable structure (virialized). Although measuring the velocity dispersion in a bulge consisting of two bulges merging is difficult and can produce errors in the measurement, simulations have shown that the velocity dispersion will only be underestimated by 50%; an amount which is not significant enough to change these results. The authors also consider whether there has been enough time since the merger began for these black holes to grow so massive. Assuming that both galaxies used to lay on typical scaling relations for the black hole mass, and that the black holes accreted at the typical rate (Eddington rate), they find that it should have taken somewhere in the range of a few 10-100 million years – a time much less than the simulated time for a merger to happen. A second consideration is how long it will take for these galaxies to virialize and for their velocity dispersion to increase to bring each one back onto the typical scaling relation with the black hole mass. They consider how many more stars are needed to form in order for the velocity dispersion in the bulge to reach the required value. Taking measured star formation rates of these galaxies gives a range of timescales of about 1-2 billion years which is consistent with simulated merger timescales. It is therefore plausible that these galaxies can return to the black hole mass-velocity dispersion relation by the time they have finished merging. The authors conclude therefore that black hole fueling and growth begins in the early stages of a merger and can outpace the formation of the bulge and any bursts in star formation. To confirm this result measurements of a much larger sample of currently merging galaxies needs to be taken – the question is, where do we look? Do the authors address the recent research you mention about bulgeless galaxies that have not undergone mergers and still have SMBHs? If so, what do they say about it? How old is a black hole in comparison to its host galaxy? Do supermassive blackholes exist outside of the centers of galaxies? If so, might observing those SMBH help us to understand these? Does which parts of the galaxies collide first or how the galaxies collide impact how quickly the black holes grow? Cool! I wonder what other scaling relations might be predicted by this mechanism. Are there any theories out there that might explain why SMBHs seem to grow faster in mergers than simulations have predicted? The authors only look at ultra luminous infrared galaxies, is it possible that behavior would be different in other types galaxies or is it thought/theorized to be fairly consistent across galaxy types? It seems like using only 9 galaxies is not ideal for running statistics. Would it be useful to expand this study to less luminous galaxies or is the data at lower luminosities unusable? This is a fascinating example of Astro ingenuity. Because we cannot observe a single merger all the way through, we instead look at a number of similar galaxies in different stages of merging to extrapolate the effects of a merger on the galaxies SMBH. Of course, with more data, the better our models will be for future predictions. I wonder if there is a connection to galaxy morphology (elliptical, spiral, lenticular) to the results found here and how they may change it if more of these different types of galaxies are considered, all of which are known to contain SMBHs at their centers. Could we not also cross correlate data with some of the real-time simulations out there of colliding galaxies?